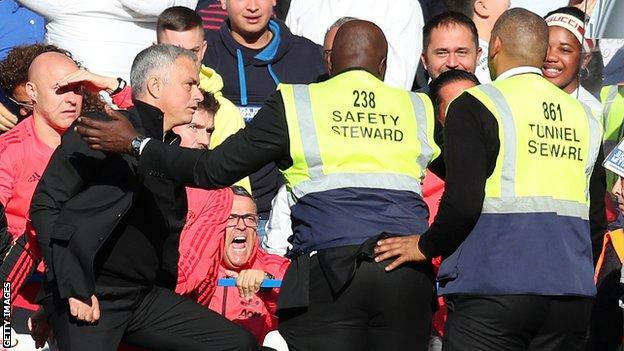 Jose Mourinho says he was blameless but “the story is over” after a fracas with members of Chelsea’s coaching staff at the end of their 2-2 draw. The Manchester United manager leapt to his feet and was held back by stewards after Chelsea coach Marco Ianni goaded him following Ross Barkley’s late goal. “It is not my reaction, it is Sarri’s assistant,” Mourinho told BBC Sport. United had taken a 2-1 lead thanks to two goals from Anthony Martial after trailing at the break. But, deep into six minutes of added time, David Luiz headed against the post and Barkley was free to bundle in an equaliser for Chelsea. “Oh come on, I can tell you that the 97 minutes of the game was so good that you have to focus on that,” Mourinho told Sky Sports when asked about the incident after the game. “I am not annoyed with anything. What happened was with Sarri’s assistant, Sarri was the first one to come to me and say he will resolve it. “The assistant has already come to me and apologised, I told him to forget it. I have made a lot of mistakes in my career. After the full-time whistle, Mourinho held up three fingers to the Chelsea fans in reference to the three Premier League titles he delivered for the Blues in two spells in charge.